I always enjoy visiting historic country house estates. They are usually chock full of history, art, architecture and beautiful gardens too. 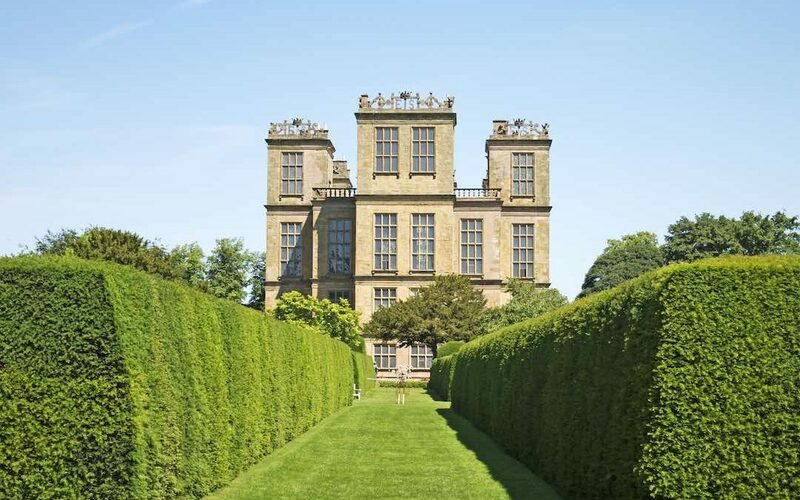 Hardwick Hall was all of that but the history is particularly interesting as Bess of Hardwick who created Hardwick Hall in 1500, produced a granddaughter, Arbella who was niece to Mary Queen of Scots and at one time a realistic contender for the throne. Following Arbella’s story was a fascinating look into the intrigue and politics of court 400 years ago. The interior architectural decor in Hardwick Hall is also something special to behold. The plasterwork in the great hall actually incorporates real leaves in the final design. It is very well preserved and as a member of the National Trust, if you are visiting other NT properties by becoming a member, you get in for free. The gardens and grounds surrounding the Hall are beautiful and provide for lovely lake and forest walks. There is even a Victorian stump garden, something you don’t see everyday. So farmers, gardeners, builders, decorators, embroiderers and craftsmen of all kinds have contributed to this masterpiece now known as Hardwick Hall on view for your day out adventure. Brimham Rocks in North Yorkshire is billed as nature’s natural sculpture park, and it truly is that. It is a photographer’s paradise as you move through weird and wonderful rock formations with panoramic views of Nidderdale and the Vale of York as the backdrop. Do check out the special activities and events there because you have a variety based on the time of the year from, rock climbing to geology sessions to bird watching and sighting specialty plants blooming. Brimham is near the Yorkshire town of Harrogate, which is itself a beautiful town with parks and blooming flowers throughout the city full of lovely shopping and restaurants after your trek at the rocks. As an American, Kiplin Hall is of particular historical interest as it was built in the 1620’s by George Calvert the founder of our state of Maryland in the USA. And one of Calvert’s decedents was Charles Calvert, 5th Baron Baltimore. (And that’s where we got Baltimore, Maryland from). Most of the aristocrats who owned this house over the years have served the King or Queen as statesman. For those with an interest in architecture, this is a well preserved Jacobean House with fine interior architectural details, furnishings and collectibles including many items from the Arts and Crafts movement. The grounds include beautiful woodland walks around the lake behind the house as well as well-tended gardens that include formal gardens and a walled garden. And as with most of the country houses, there is a tea room. Newby Hall is near the Yorkshire town of Ripon. It is one of the finest country houses in England. The elegant Robert Adam’ s interiors are a real feast for the eyes. Filled with superb paintings, Chippendale furniture, ancient Roman Statues and Gobelins tapestries, houses just don’t get any better than this. Newby doesn’t stop your enjoyment with the house, the outdoor gardens are simply an experience that no garden lover should miss. Herbaceous borders, formal gardens, woodland walks thru rock gardens and the National Collection of Cornus(dogwoods) are all there for your viewing pleasure. In addition, there is plenty for the children as they feature a special Children’s House Tour on Sundays, have a miniature railway for the kids to ride and a children’s adventure garden. We ended our day there at the Garden Restaurant and found it to be delightful.